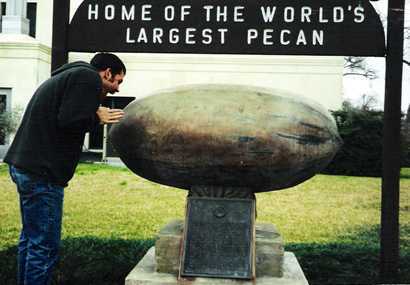 Seguin Texas Home of the World's Largest Pecan. Anyone Got a Nut Cracker? "Home of the World's Largest Pecan"
Seguin, Tejas: the town famed author Sandra Cisneros (who lives in San Antonio) describes as having "[a] nice sterling ring to it," like "[t]he tinkle of money" has quite a unique downtown tourist attraction. Poised atop a concrete pedestal in the middle of the courthouse's lawn rests a larger-than-life sculpture celebrating one of the town's native crops: the pecan. Mmmm-hmmmm. That's right. Pecan are very much a staple fare of Texan cuisine. From pecan pancakes to pecan pies, pecan patties to pecan-crusted catfish, pecans reign supreme as a hearty native addition to any dish. Texas' 36th legislature proclaimed in 1919 that the pecan tree be the official state tree of Texas. And the 77th legislature (2001) continued the praise by declaring the pecan the official "health nut" of the state. 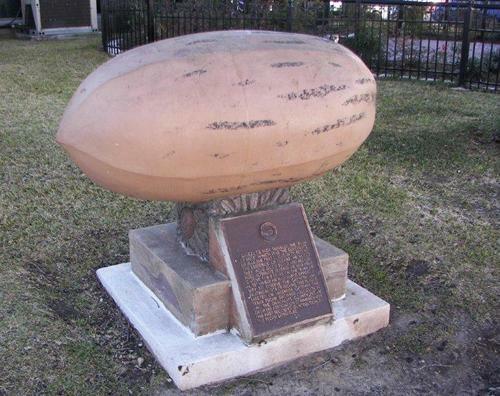 So why shouldn't the pecan be immortalized for the public? There's something to be said about the unusualness of this local tribute. It's evidenced as easily by the Chamber of Commerce's touting of it on its list of "Things to See and Do" as it is by literature. Cisneros shows the pecan's importance to the city's identity through her playful description of it in her short story "Woman Hollering Creek;" she describes Seguin as a "town with its silly pride for a bronze pecan the size of a baby carriage in front of the city hall." "Silly," perhaps. But uniquely and unabashedly Texan, proving, once again, everything IS bigger in Texas.